Going on a Royal Caribbean cruise these days and you are bound to see plenty of offers to purchase an unlimited drink package, which begs the question, "is a drink package worth it?". Many years ago, the marketing geniuses at Royal Caribbean realized that guests really love convenience, and they hate having to take their wallets out on vacation. And so, Royal Caribbean's unlimited drink package option was born. Each drink package has several price points and levels. With a drink package, you get access to certain beverages for the duration of your cruise. It may be convenient, but it is not always a good deal. Before you can even begin figuring out if a package make sense to get, you need to have a good understanding of what they are and how they work. 40% discount on wines under $100. Wines above $100 will receive a 20% discount. Within each package, the benefits are unlimited, so you can enjoy as many drinks as your package allows. There are no daily or cruise-length limits. Each guest must purchase one drink package for themselves, and there is absolutely no sharing of the package benefits. At the heart of figuring out if any of the drink packages are good value to you is, well, math. The cost of a package is for the duration of your cruise, so if you pre-purchase before your cruise or buy it on embarkation day, you will be paying for use of it for the duration of your cruise. If you buy it on day three, it will be good for that day onward. The idea to grasp is how many drinks you have to have per day, to "break even" on the package cost so the package is actually worth your money. If you do not drink enough to break even, you would have been better off financially not buying a drink package. If you are wondering how many drinks per day that is to "break even", it is somewhere in the ballpark these estimates. Keep in mind the deluxe package allows for different kind of drinks, so the drink prices you will find can vary greatly. 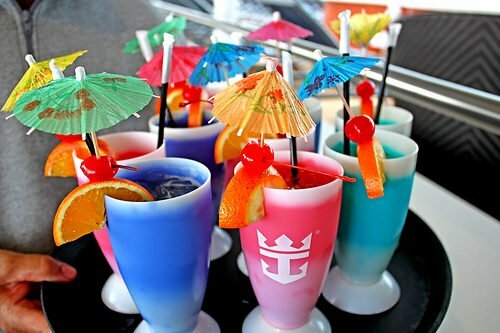 The best way to figure out if you want a drink package is consult our list of Royal Caribbean drink prices, and start to figure out what you would be interested in ordering and see what kind of bills you can accumulate. Figuring out if a drink package is worth it involves some subjective reasoning beyond just objective math. There are going to be drink specials throughout your cruise, which bring the price down of drinks and that makes it more difficult to "break even" on the drink packages. As an example, the drink of the day will carry with it a 25% discount. Any drink that comes in a souvenir glass or container is not included with the drink packages, so those sports bottles the Labadoozies come in or the hallowed-out pineapple drinks are going to cost you extra. When you are in port and off the Royal Caribbean ship (not including Labadee or CocoCay), your drink package does not work. Being on shore limits the time in the day you have to drink as well as requires you to still pay extra for alcoholic beverages. With all of the data presented, now it is time to figure out if a drink package makes sense for you. Can I drink 5-7 drinks per day, every day of my cruise? If after thinking that you initially thought, "Woah, that is a lot to drink" or "Woah, that's it? ", then you probably have your answer. There are a few "x-factors" worth considering was well when it comes to any Royal Caribbean drink package. Drink fatigue: This phenomenon occurs as the cruise progresses, each day you find yourself drinking for the sake of drinking as a means of "breaking even" on your drink package investment. Anyone can drink 5-7 drinks in one day, but 5-7 drinks every day of the cruise could possibly get old. Trying new drinks: One of the best reasons to get a drink package is that you can enjoy all the drinks available, including some new ones. You can order something and not be worried that you might not like it and have to "suffer" through it, simply because you paid for it. 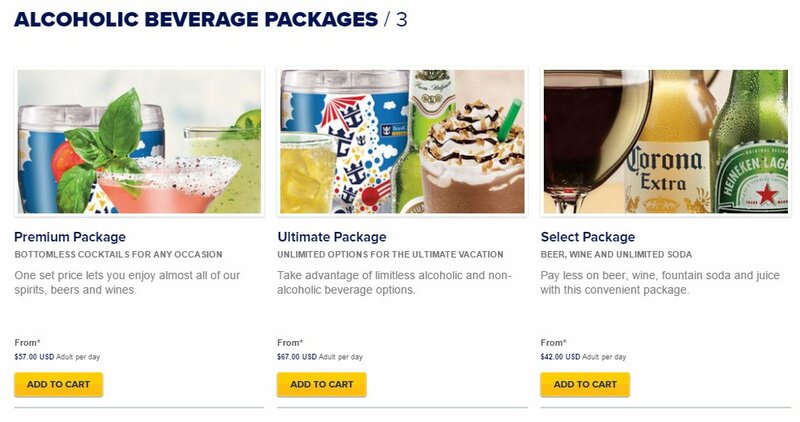 Drink package discounts: Discounts on Royal Caribbean's drink packages used to be nonexistent, but these days, we are seeing more discounts being offered on the drink packages, which bring down the total cost. A 20% package saving might be enough to push some folks "over the fence" to make it a worthwhile investment. The reality is there is no global answer for everyone. You have to figure out the math for yourself. There is no question Royal Caribbean's unlimited drink package presents a definite value proposition and you can make it work. Plenty of past cruisers swear by it. On the other hand, everyone's tolerance for actually wanting to have a drink is different. And since the reason to buy an unlimited drink package is the convenience and fixed drinking bill, one should consider just how much value the package offers. Do you think Royal Caribbean's unlimited alcohol packages are worth it? Tell us why in the comments!